This year has brought a new perspective in our lives, as being Christ’s stewards in all the gifts He has entrusted – time, talent and specially treasures (resources). The past topics about stewardship have reminded me of being God’s faithful steward in every gift that he has given. Last 2011 God has taught me to be grateful for everything I have. As our family grows bigger, needs become greater. Most of us would care of our own family’s sake and need. There are also times that I also wish to have the things that we don't have such as: a new beautiful house, appliances, gadgets, new trendy clothes and shoes, what's in with the children's toys and the like. At times I really do find myself murmuring to God - asking for things that I wished we had. But God would remind me of his provision that we do not lack the things that we really need day by day. It’s true! Never in my whole life that God had not provided for our needs. Neither did God allow anyone of us gets hospitalized. A proof that God's care is upon us. He didn't let us skipped even a meal...most of times we had so much food that we would have to share it with others. It's almost four years that I haven't had a personal job. After getting married I chose to focus being a house wife. Money wasn't a problem way back then when I was still working in a private laboratory, single - without having any financial responsibilities. I could still recall giving everyone a gift during Christmas and special occasions. How I missed the way that I am giving before, and I know God is urging me to do it once more. In my earlier practice in giving gifts during Christmas, I would make a list of names of the persons who will be receiving the gifts then I'll do the shopping. Since budget was not a problem before I wouldn't really care how much an item would cost. As a mother, now I had to consider the budget that is only allotted for buying gifts. When I will look at our household expenses and the things that we needed to buy in the house, I'll be starting to realize that there is no sufficient amount for gift giving. Few months before Christmas I planned and think of ways on how can I give more gifts. Most of the times it needed creativity to make your gifts outstanding without you requiring spending large amount of money. One thing that I have learned this 2011 is to maximize the resources God had entrusted you. The resources are now in our hands, the question is how we are going to use them. God has also given us the talents that we needed to be productive. This is being a steward of God's given blessings. These blessings should also be given to others so that God will pour out more blessing as we become a channel to others. Just to share, the gifts that I have given to my dear friends were all handmade; I personally made those items, just because they are dear to me. The gifts are labor of love and creativity as I would say. Hoping that they felt the message as they receive the gifts I have made. I love making crafts, for the past few years I am supporting waste segregation and recycling. I tried to make earrings and key chains out of paper beads...I was able to make about 50 pairs of earrings. I also love plants. I was able to multiply my cute little plants then I bought small pots, painted and decorated it for my gifts also. It didn't cost a big amount of money, but I was able to make so many gifts for everyone. 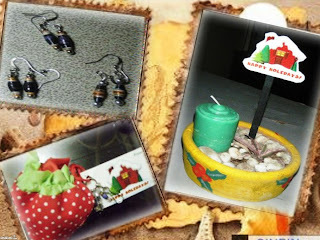 I enjoyed my crafting projects and had the fulfillment of my desire to give gifts. It is really a different kind of feeling when you share your blessings with others. 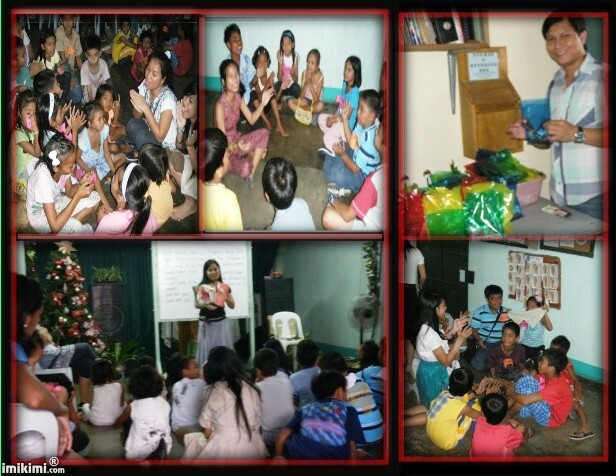 It was early December, I talked with my husband that I wanted to have gift giving for the less fortunate children. I wanted our church to host a Christmas party for them. We are thinking of the budget for these children and how can we raise it. We thought of persons who could be of help but none of them responded. But still I wanted to pursue the event with the available cash I had in my own pocket and it was not a large amount, we buy some candies and packed it with Book of Hope so we can give it to the children. God is good that He also touched our church members' hearts and were able to assist and contribute for the said event. The party may not be so extravagant. But we have seen how we put smile on those children's faces. We may have given them small gifts but we felt how much they have appreciated it. Our gifts don’t have to cost much. What matters is we have given our very best. It's the thought and motives that counts most. I knew God is still teaching me to be more generous. For it to happen it requires being one of His faithful stewards.